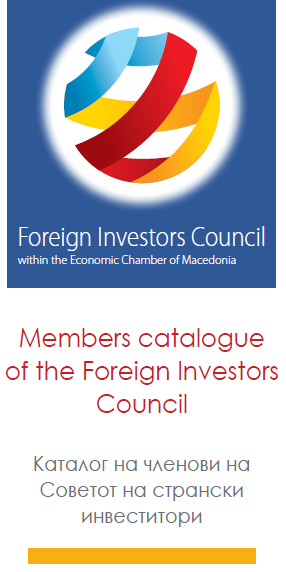 The Foreign Investors Council was established on 27 February 2006 with a Decision on the Establishment of a Foreign Investors Council adopted by the President of the Economic Chamber of Macedonia. FIC is a voice of business community, established with the goal to make Macedonian economy more attractive for investments by simplified rules and increased predictability. Promoting solid business ethics and high corporate governance principles is also high on FIC agenda. Currently the FIC consists of more than 130 companies with foreign capital in the country. • The member companies of the Foreign Investors Council believe that a dialogue between the policy makers and the foreign investment community lies at the very heart of a successful improvement of the investment climate, while stimulating Macedonian economy. • The Foreign Investors Council will promote pro-business initiatives and deliver practical support to all investors so as to improve the business environment in the country. • The Foreign Investors Council aims to be the single voice of foreign investors in the country. The Reality Check Position Paper – This document is envisaged as a useful tool to remind the authorities about the recommendations from the latest White Book and assess status of their implementation. This event is a great possibility to celebrate the long-term dedicated work of the Foreign Investors Council and a promise for further successful projects, events and happenings that will confirm their social responsibility.